Batribike electric bicycles: All Change – But Still The Same! All Change – But Still The Same! Changes to the Batribike team – but not to how we work and what we do. There has been quite a bit going on in the Batribike office recently. It is one of those times when you know that stuff is happening but you can’t say anything about it until it actually happens! There is that air of suppressed excitement, tinged with fear that you might accidentally let the cat out of the bag! Whilst most people know us as Batribike our business name has always been Fallowgate Ltd but 2018 has brought some changes. We have been working with Danish company Pro-Movec for almost two years. They supply the electrics that are fitted to our ebikes at the manufacturing stage. But now we have formed a new company, Batribike Ltd with Jesper Lundquist the CEO of Pro-Movec. 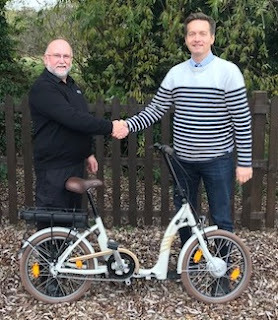 The team at Batribike here in rural Lincolnshire stays the same, and the way we work and our bikes stay the same, but this strong new connection brings more ‘clout’ when it comes to manufacturing. All the factories in Europe are busy. The electric bike revolution and increase in sales means that it is becoming harder to get time in the factories. An alliance like this brings more buying power and ensures that we have the best quality and we can maintain a good flow of stock. Just like us, Pro-Movec has over ten years experience in the electric bike industry. We have similar values and a total commitment to, and love of, electric bikes. The new partnership also means that we have increased access to all the latest smart developments in ebike technology. For Pro-Movec there are benefits too. We are committed to using their excellent electric system here in the UK. The Pro-Movec electric system has industry leading warranties on the motors and ground breaking transferrable warranties - up to 5 years on batteries. This gives value in second hand electric bikes, an area where there has previously been no consumer confidence. Batribike electric bikes will still be fitted with the Datatag Stealth Pro cycle security marking system. We are the first and only UK manufacturer to fit this to all of our bikes. We also offer a one-month free electric bike insurance backed by Lexham Insurance one of the country’s leading 2-wheeled insurance brokers. With all this bubbling along under the surface you can see how excited we have been to make the announcement and we are looking forward to a very promising 2018.